I didn’t realize until after I had finished OVER MY HEAD that it is actually somewhat of a sequel to Marie Lamba’s debut novel What I Meant. Which means that OVER MY HEAD can be enjoyed on its own. It is a quick, sometimes annoying, but still gratifying look into a mixed Indian-Caucasian teen’s ups and downs.The YA world very clearly needs more books like OVER MY HEAD, where the main character is of mixed race, culture is an important part of the story, but the story itself is not about accepting one’s culture or battling people’s ignorance of your culturally different family. Everyone knows a girl like Sang, a girl who is smart but is struggling with familial tensions, who is dealing with changing friendships and fending off the comments of less sensitive classmates. So, take an extremely relatable teenaged female protagonist, add in a dash of Indian culture, and you’ve got a setup that’s easy to connect to yet just different enough to expand readers’ horizons.Younger teens may be better able to appreciate OVER MY HEAD, as I found Sang and a lot of her behavior a tad immature for my taste. Okay, yes, I understand that feeling restricted by your parents’ seeming lack of trust in your maturity level may drive you to do irresponsible things such as ditching your siblings or sneaking off in the middle of the night with a boy who may or may not be taking advantage of you, but I suppose this was something that I never did in high school (okay, maybe I treated my siblings poorly every once in a while. It’s what big sisters do sometimes, eh? ), and so I felt that sometimes Sang’s actions felt a little contrived, a little overdramatic. Some other characters and their situations felt similarly unnatural, mean girls who acted like convenient nemeses to raise our esteem of our beloved protagonist.Sang’s peers may for the most part feel forced in my opinion, but OVER MY HEAD depicts the nuances of Sang’s family extremely well. I really enjoyed Raina, Sang’s cousin who comes to stay with her. Raina could’ve been yet another shallow mean teenager, or a self-pitying mess, but she is at times shy yet determined, vulnerable yet resilient. Sang’s parents behave believably strictly as well as lovingly, and so on. I often feel like familial relationships are the trickiest things to depict realistically in YA, and so Marie Lamba gets numerous kudos for portraying the Jumnal family in such an empathic and rich way.Overall, OVER MY HEAD may feel a bit young for high school readers, but younger readers will most likely find a bit of themselves, their frustrations and their desires, in Sang, and cheer this promising young lady on. I don’t usually read books like this. It’s takes place in the summer (not my favorite season), it’s about a girl looking for love and a boyfriend (I never dated in high school) while she’s learning to swim at the local pool (I hate pools). But a friend suggested it to me. I gave it my usual test: “I’ll read twenty percent of the book. If it’s not doing anything for me, I’m gone.” I read to the end. And quickly. Here is a book that makes you feel the summer vibe no matter what time of year you open the book. It’s all there: the sun, the sweat, the smell of cut grass and warm night air. It’s about a teenage girl looking for love (sometimes in the wrong places) and trying to understand the world. It makes you laugh. You feel some genuine emotions. It’s a book about a teenage girl who learns what it means to really say “I love you.” I hadn’t read a book like this in a long time. Lamba’s clean and funny prose kept me interested in a subject that I would usually pass on (teenage girl looking for love and meaning? Not my typical bag). Her craft for tension and dialogue is embedded in her words. They sometimes feel like they’re humming off the page. I actually looked forward to my evening visit with Sang and her exotic, inter-ethnic family as they struggle to put down their roots in quaint Doylestown, Pennsylvania. You hope for them. You root for Sang. You hope she and her family find their way in the fast-paced American landscape, but you also hope they stay true to their Indian traditions so that their deeper understandings of family and love can emerge like a swimmer from the deep end of the pool. And there’s a catfight scene that is just bracingly accurate and laugh-out-loud hilarious. You can’t beat that combination. Loved this book :) Very sweet, very touching. Loved all the drama, the teenage problems, the heartache, the love. I was really transported along with Sang, and I felt everything she goes through. I rooted for her the whole way through and the ending made me tear up a bit!I read it so quick, Lamba's writing is a delight and flows so well. She combines comedy and pain effortlessly, I would love to read another of her books. In fact, I'm all smiley now, it's left me with a really warm feeling, and that's always a good sign! Although Over My Head is really a sequel to Marie Lamba's What I Meant (Random House), it reads perfectly as a stand alone novel – which is good, given that I've not read the original! It's an entertaining contemporary YA offering, which has a generally light tone but nonetheless manages to deal with some very big issues in a particularly sensitive manner.Sang is the daughter of an Indian-American (Sikh) father and an American (lapsed Catholic) mother, and this heritage informs much of the novel's plot and the issues that Sang encounters within the book's pages. Sang herself is represented as being very much American, despite her strong ties to the Indian side of her family, and much of the novel's action centres around the conflict between Sang's American sensibilities and her father's traditional Sikh values. Lamba does an excellent job, however, of ensuring that the father remains a sympathetic character, even when he is most at odds with Sang. In fact, all of the members of Sang's family are well-drawn and pleasantly three-dimensional. The embarrassingly nicknamed Doodles felt a little young for her age, but that could well be a result of her over-protective upbringing. Hari is, at turns, caring and frustrating, much like a big brother should be, and their mother felt particularly well-developed to me. The reader is given several poignant glimpses into her own, personal story as someone who has married into a different culture.Raina, Sang's cousin, who is visiting from India, is very likeable, although she sometimes feels more like a foil to Sang than her own person. It is her story that felt the most unfinished at the end of the novel and I would have liked to see more of her adjustment to teenage life in America and any conflict that may have existed between the world Sang was drawing her into and the values that had been instilled in her by her parents. Another sequel, perhaps!Of the three boys who influence Sang's summer, Cameron is the most thoroughly-developed. I'm still not entirely sure what to think about him, though. As the love-interest of a fairly naïve sixteen-year-old, he makes perfect sense, but there's something about him that rubbed twice-as-old me up the wrong way from the very beginning. In contrast, I really liked Dalton and wished that we'd had the chance to see a little more of him in Over My Head. While he (understandably) becomes frustrated with Sang at times, he is kind, loyal and dependable and is a great friend to her whenever she needs it – and regardless of whether she deserves it. Team Dalton all the way. Finally, Sang herself is wonderfully realistic. She's passionate and impulsive and sometimes thoughtless, but she has a good heart, which is always obvious, and a strong love for her family. She doesn't always get things right, but the reader is left feeling that she will learn from her mistakes and grow into someone admirable in the end.Over My Head is a strong contemporary offering, with an interesting, multi-layered plot and a likeable cast of characters. Marie Lamba deals with cultural conflicts with warmth and sympathy, while accurately representing young love, with all its accompanying mistakes and embarrassments. A solid read. I don't normally read YA but completely enjoyed this book - a good read full of teen angst, drama, complex family dynamics, love, and loss. I was thrown back to my teen years and deeply felt Sang's pain, joy, hopeful wishes and embarrassments as my own! We catch up with teenage girl Sang heading into a swirling upside down summer of the unknown. Sang's summer holds a confusing weave of crushes, new friends, arch enemies, family problems, and humiliations. Sang's pivotal summer just may be the place where she finds her sea legs and swims, instead of sinking. A place where she may finally find herself. And YA Author Lamba gives us a delightful, bittersweet tale to follow - with a heroine we ache and cheer for. Lamba certainly piles on the heavy, complex family dynamics in Sang's life, making it even more difficult for her to wade through on top of her regular teen issues. Lamba also knows how to vividly draw her readers into a painful teen world where the smallest mortifications can snowball into larger problems. And a world where embarrassment lurks in every encounter, waiting to happen. Lamba gives us the black and white world of a teen. We witness how a teen's peers can have the power to shoot down a young girl with a few words. It's all or nothing. A world where every day is a roller coaster ride of highs and lows. Yet, Lamba leads Sang down the path to finding her own balance in this rigid world. A world where sparks between a boy can signal true love or not and we, the reader, seethe with death wishes for Sang's arch enemy!You champion for Sang, as she often searches for the very thing that is in front of her all the time. As Sang learns the true meaning of family and friendship, she also discovers that while you don't always get what you want you may get what you need from the very forces you think are transpiring against you - the ones who love you.Get ready to be teary-eyed at the end of this sweet coming-of-age book by a wonderful YA author. If I had a teen daughter I would want her to read this. This was a book I received through the Goodreads "first reads" program, so I was very excited to receive it in the mail! The story revolves around 16 year old Sangeet, or "Sang" as she is called. This is a nice, light summer read as the story itself is about one summer in Sang's life. She experiences many typical teen issues: she likes a boy but isn't sure how he feels about her, another boy likes her but she just wants to be his friend, a mean girl is always picking on her...The issues are pretty standard; however, many teen girls face similar problems, so readers will be able to relate. The part of this story I found most interesting was the cultural side. Sang is American, but her Indian cousin is spending the summer with her, and their relationship reveals some of the similarities and differences in the way they have been raised. There is also a sub-plot involving a sick relative, but it seemed kind of secondary to the girl drama, and sometimes I felt like it was just in there to try to add some substance. All in all, this is a good beach read (or poolside read since many scenes take place at a pool!) Enjoy! This young adult book is about one half Indian’s summer vacation where instead of spending a week at the Jersey Shore they have purchased a membership at the local pool club. Sang’s parents sign her up for swim lessons at the club in order to help her get over her fear of the water. She meets and falls for the lifeguard who helps out with her swim classes where she is one of the oldest students along with her cousin from India who is visiting with her family for the summer. Her younger sister Doodles is trying to raise money in order to help their parents in order to pay for a bone marrow transplant for an elderly relative in the States. This book takes an honest look at the experience of a teenage girl who falls for an older guy that her father doesn’t agree that his daughter should be dating. A good read, folks, 'specially for you young-uns out there. Ms. Lamba's high school characters get chances at doing right, doing wrong and doing each other over a long, hot summer. This YA novel watches the local high school population grab for all the gusto that the warm weather brings (parties, swimming, spooning), except lead character Sang Jumnal has two rather tough issues to overcome: her phobic aversion to swimming pools, especially ones with water in them, and her mistaken assumption that the world revolves around her and her quest to attract a certain college-aged hunk. Fast-paced, rewarding climax. Over My Head continues telling Sang Jumnal's story. Reader's first met Sang in What I Meant. Over My Head begins with the summer stretching out in front of Sang, and she's imagining all of the possibilities the summer has to offer. Sang learns very quickly the only thing she can count on in life is change. Sang deals with the ups and downs of family life in a very realistic way. This is a novel full of character development. It was a fun and poignant read. This was an interesting story about a teen girl struggling to deal with some major issues in her life. Everyone in her family is keeping things from her and she finds herself in some humiliating situations . . . and with a plan to find summer love. I loved the whole summer love story here. A young girl starts out with all her hopes of what the summer will bring. She learns about love, life, friends and family and what is truly important along with discovering her own strength. Excellent young adult book! i thought this book was great. I mean it had some sad parts, but it was also funny. i couldn't put the book down. You gotta love it. This book will become one of our YA books here at the Jackson County Library. I hope all our young readers enjoy it as much as I did! i honestly like this novel, an easy to read, i finished reading after a few hours.I must commend marie's ability to crack me up and touch my heart at the same time. Fun read! Adults and young adults alike will enjoy it. I thought this book was great! The parts that were supposed to be funny were absolutely hilarious! I'm not rating this book as I did not complete reading it and I don't feel it fair to rate a book that I did not complete. It was nothing to do with the book itself, I sometimes just have moments where I am not feeling the book even though it has a lovely writing style or story to it. Sadly I just could not get into this book at this time and have since passed it on to someone else to give it a chance. Thank you to the author who supplied me with a copy for review. Because TBI is such a devastating experience for a family, individual and friends....I can't say I enjoyed reading about it as a novel. 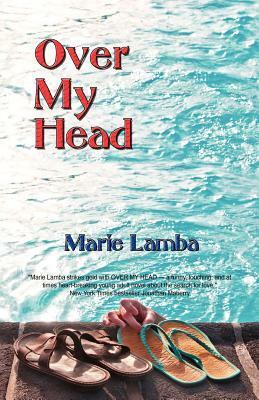 Marie Lamba - Marie is the author of YA novels including WHAT I MEANT (Random House) and OVER MY HEAD. Her newest novel DRAWN is about an artist who falls for a medieval ghost with a sketchy past. Marie's debut picture book GREEN GREEN: A COMMUNITY GARDENING STORY, co-authored with Baldev Lamba and illustrated by Sonia Sanchez, came out through Farrar Straus Giroux/Macmillan in May 2017. Also, she's author of the upcoming picture book A DAY SO GRAY (Clarion)publication date TBA.Marie has a short story in the anthology LIAR LIAR, an essay in the anthology CALL ME OKAASAN: Adventures in Multicultural Mothering, and she's a frequent contributor to Writer's Digest magazine. She is also a Literary Agent at Jennifer De Chiara Literary Agency in NYC.